Recently, Research Intelligencer approached PQ Media with the following question: How much of total consumer media usage is spent solely with advertising? This is a very complex question because often when advertising is the media content, people are not consciously interacting with the message as they would with entertainment and information content. For example, a viewer will concentrate on the plot of a favorite TV show, but once there is a commercial break, he or she might use a DVR to skip the ads, leave the room or start texting while the ad runs. Similarly, as this person reads the print edition of a newspaper, he or she concentrates on the article, although the peripheral vision notices the ad next to the article, but not necessarily the product being advertised. 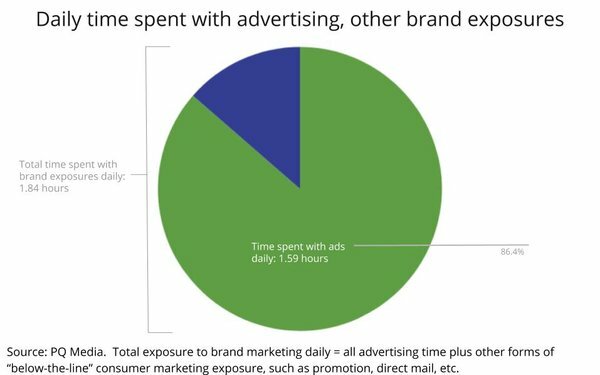 Thus, the term “exposure” becomes more relevant than “usage” in determining the time spent by consumers with advertising. When defining exposure to advertising, one cannot use a simplistic formula for each medium. For example, until the mid-1980s, the Federal Communications Commission regulated television commercial time -- 18 minutes per hour during most dayparts, with variations during late night and political campaigns. Thus, in 1975, one might be able to examine TV usage and simply multiple by a 30% share (i.e., average of 2.73 hours a day viewing television X 30% = 0.82 hours per day with TV ads, or approximately 49 minutes). However, the case that led to this regulation to be overturned resulted in the development of informercials (30- minute to 60-minute advertisements) and home shopping networks. Concurrently, as cable TV became more readily available in cities, more consumers were subscribing to premium cable networks, like HBO, with no advertisements. More recently, with cord-cutting, over-the-top (OTT) video services, like Netflix, have flourished and begun producing original programming, most of which also has no advertising. In addition, more than 50% of television households have DVRs with ad-skipping technology, and more than 50% of digital device owners use ad blockers in the U.S. Thus, not all viewers are exposed to the same number of advertising inventory, regardless of whether they are using the media the same amount of time. These are some of the factors that needed to be considered when determining ad exposure time to advertising within a specific media platform. Not included in this analysis is the time spent by consumers with marketing media, such as direct marketing, experiential marketing and other marketing platforms that PQ Media tracks in our “Global Advertising & Marketing Forecast Series.” Yet, there are individuals who periodically spend hours per day clipping coupons, examining products in catalogs, attending a sporting event at a brand-named stadium, choosing entertainment venues with a mobile proximity app, passing by multiple point-of-purchase displays while shopping, and watching an automobile product placement throughout a film blockbuster, among others. To answer Research Intelligencer’s question, PQ Media estimates that the average consumer was exposed to approximately 1.59 hours per day of advertising on traditional and digital media platforms in 2017, slightly more than 95 minutes per day, about 15% of total time spent with media. Combined, four media platforms and channels accounted for more than 85% of all advertising exposure: television, out-of-home media, radio, and search. Meanwhile, if marketing media, like coupons and direct mail, were included in the equation, PQ Media estimates that total exposure to brand marketing would reach approximately 1.84 hours per day, or 110 minutes. There is one caveat to these estimates. The number of hours per day that someone is exposed to marketing messages is probably closer to two hours per day if other subconscious interactions with brand packaging are included. Noted advertising economist and long-time Interpublic forecaster Bob Coen stated back in the 1960s that the average consumer is exposed to more than 3 million marketing messages by normal day-to-day activities: for example, opening a refrigerator containing more than 100 branded items and passing by thousands of cars with manufacturer’s logo on the highway, etc. With the proliferation of new media platforms and devices since 1960, the number of subconscious marketing messages probably is closer to 4 million interactions per day in 2017, confirmed by Mr. Coen when a PQ Media executive was on a panel with him in the past decade before he passed away. 3 comments about "Time Spent With Advertising Daily". Ed Papazian from Media Dynamics Inc, April 2, 2018 at 12:22 p.m.
Leo, as I'm sure you are aware having an opportunity to see, read or listen to an ad is not the same thing as actually doing so and paying some degree of attention to the message. The actual amount of time we devote to attentively consuming advertising is far less than the amount of ad content are "exposed to" . In our latest issue of "Intermedia Dimensions 2018" we estimate that the average adult is "eposed to 374 ads per day, of which only 154--- or just over 40%---are probably "noted". If we project time spent guesstimates to our ad noting figures we come up with about 45-48 minutes per adult, per day of attention to ads in the five media---TV, radio, magazines, newspapers and digital---with about 60-65% of it being spent watching TV commercials. Larry Wiken from WIKEN INT"L, April 2, 2018 at 12:24 p.m.
Good report! Unless relevance and messaging improve dramatically unconscious exposure will grow exponentially. Leo Kivijarv from PQ Media, April 2, 2018 at 4:39 p.m.
Ed, you make a good point about the differences between engagement and exposure to ads, knowing full well that people don't really engage with any advertisement unless they are in the market for a product, for example examining every auto marketing message when purchasing a new vehicle; or the content is riveting, like those that debut during Super Bowls. The analysis PQ Media (PQM) prepared for ResearchIntelligencer was based on data from PQM's 5th edition of the Global Consumer Media Usage & Exposure Forecast Series, and was specific to advertising (and marketing) that one comes in contact with on a daily basis, per our knowledge of media consumption from publishing data on the subject for almost 25 years.